National Remote Sensing Centre (NRSC), ISRO has prepared nationwide ground water prospects maps, sponsored by Department of Drinking Water and Sanitation (erstwhile RGNDWM), Ministry of Drinking water Sanitation (MDWS), Government of India (GOI). 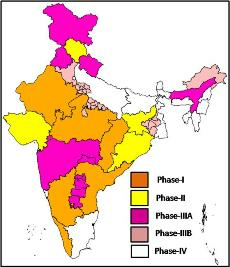 The above maps are generated under Accelerated Rural Water Supply Programme (ARWSP) which was the major developmental activity of GOI in water sector to provide drinking water to all the habitations in a time-bound-period. However, scientific database on ground water, which facilitates identification of prospective ground water zones for systematic selection of appropriate sites for drilling, is not available in many states to tackle the drinking water problem on war footing by the concerned state officials involved in rural water supply. Hence entire India ground water database was created (spread over 4898 maps) covering all the habitation in a phased manner (Phase-I to IV) on priority basis. The possible ground water sources were delineated for drinking within the radius of 1.5 km covering for all habitations using Indian Remote Sensing (IRS) series of satellite data (1C, 1D & Resourcesat) on 1:50,000 scale. Presently the GOI has renamed this programme as National Rural Drinking Water Programme (NRDWP). Ground water being a hidden resource is difficult to dig out without proper understanding. Hence NRSC/ISRO has brought out nationwide scientific database on prospective ground water information from the state-of-the-art ground water prospects maps generated for the past one and half decade through Bhuvan-Bhujal portal. This information can be utilized by the govt/private agencies for development of ground water. 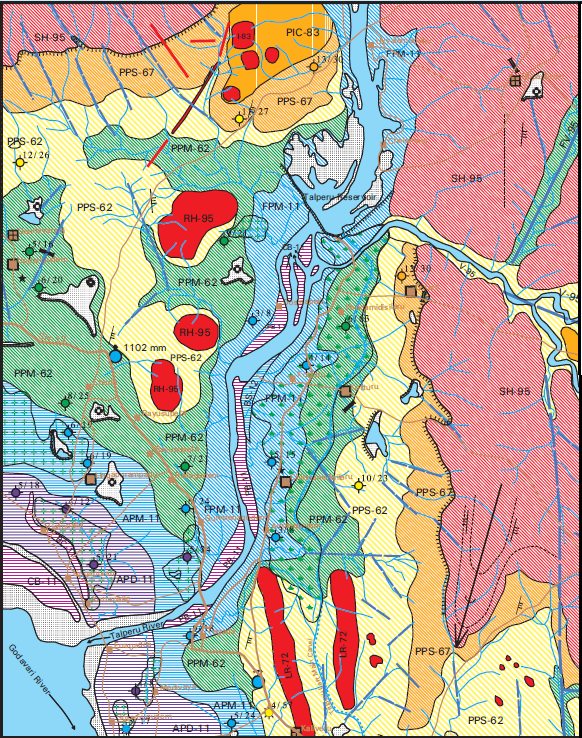 It provides the required information on geological parameters connected to ground water exploration and the probable ground water prospects. It narrow down the area of investigation for prolific selection of 1) sites for drilling and 2) for planning recharge structures, ultimately to address the drinking water problem more effective manner. ii. Ground water prospects ( For Authorized users only) : • Probable Depth and yield range of wells. a) Spatially user can visualizes the Ground Water Prospects information in terms of depth (shallow, moderate and deep) shown with three colour hatching patterns (horizontal, inclined and vertical) and yield shown in seven colours (Violet, Indigo, Blue, Green, Yellow, Orange and Red).